Southern California is a beautiful place to live. There’s a multitude of things to do with family and friends. But when you’re home, you’re probably looking for some peace and quiet in the comfort of your own backyard. That’s where privacy walls come into play. What do Privacy Walls do? In some instances, a privacy wall is a necessity. It helps you avoid looking at an unsightly highway or business lot. It may be the marker for property division. In other cases, it’s a useful tool. It can break your yard into sections—creating a space for adults to lounge and enjoy cocktails, and space for the kids to play. They’re a great addition to your deck or pool area. Privacy walls can be utilized anywhere on your property—indoors or outdoors. Perhaps you already have an existing wall, or you’d like to create one. 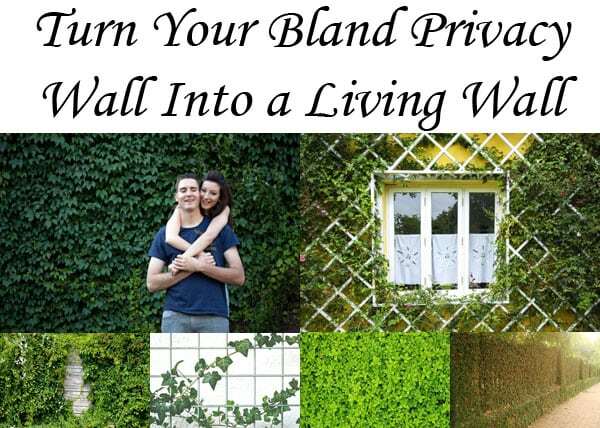 A beautiful way to spruce up your landscaping is to have a living wall. This article will give you some creative ideas to do either. But first, let’s discuss what a living wall is. A living wall is also referred to as a vertical garden or a green wall. Just as the name suggests, the wall is made up of various types of plants. Living walls have been around since the 1930s. They were used mainly by architectures looking for special recognition. They’re still popular with businesses but are gaining popularity in residential settings. Grow vines on the wall. Place a trellis on the wall. Build a raised bed of ferns, tropical plants, or vegetables in front of it. Attach a living wall to the existing structure. Decorate it with garden art. Vines are an easy way to cover an existing privacy wall. As they grow, they will cover the wall in beautiful patterns. They come in a variety of colors and styles and can be used with or without a trellis. 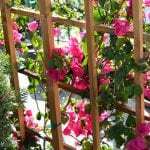 Trellises can be attached to an existing wall with little labor on your part. They come in a variety of materials, such as wrought-iron or heavy wood. Keep in mind what types of greenery you’ll be using when choosing the weight of the trellis. You can create different levels of shelving with trellises. Building a raised bed for shrubbery or vegetables will cover the base of your wall. You can add smaller plants and succulents higher up for added flair. Living walls are quite beautiful, but they do need a bit of maintenance to keep your foliage alive and well. Southern California is known for its dry climate, so creating a wall out of succulents or other plants that need little to no water is a great idea. Professional landscape designers are very knowledgeable on which plants to use for the most success—and the least maintenance on your part. We offer a free landscape design service when a $500 gift card is purchased at our Lake Forest store location. Interested? Check out our Lake Forest Free Landscape Design page. In addition to plants, you can add garden art to the wall or a trellis. Place it at the base of the wall to fit in with your greenery theme. It’s important to keep in mind how much maintenance you plan on doing with your wall. Some plants do well with little tending, while others will need to be monitored closely for watering. There are many other hardy vines that will do well on your wall. When choosing vines, don’t forget to help them cling to the wall structure. Annuals and perennials come in a variety of colors and shapes. When choosing your plants, keep in mind if your vertical garden area is shaded or not. Succulents are an awesome way to add beautiful color and style. They’re low maintenance, and you can use a large variety of styles to create a mosaic effect on the wall. 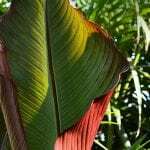 Tropical plants come in a variety of styles and sizes. This type of plant would be awesome at the base of your wall, with smaller foliage above them. Vegetables can add beauty to your living wall but would be best planted at the bottom in a raised garden bed due to their weight. As you can see, revamping an existing privacy wall isn’t all that difficult. Now let’s take a quick look at creating a DIY living wall. Creating a DIY vertical garden is very fulfilling. The main difference is that you would be creating the wall from scratch. This would give you the option of combining your building supplies, such as wood, brick, and trellises instead of covering the existing wall. Choosing your plants would remain the same as mentioned above. Gardening and landscaping are wonderful any time of year but creating your living wall in the Spring is especially rewarding. Your greenery will have plenty of time to become accustomed to its growing area, and you’ll be able to see the beauty of the plants throughout the summer. Shopping for landscaping is a wonderful way to spend the day. 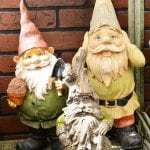 Green Thumb Nursery is your one-stop shop for all your gardening and landscaping needs. We have five nurseries throughout the Southern California area. All our garden shops are well-equipped with products for any of your projects and staffed with knowledgeable, friendly people. Stop on by Green Thumb Nursery for all your gardening needs—and get started on an awesome Springtime landscaping project today!